It will look even better once I have some event info in the blank area. Gotcha. I figured it was my screen causing the issue. Is this powered by Raspberry Pi or Surface RT? Tyler wrote: Gotcha. I figured it was my screen causing the issue. Is this powered by Raspberry Pi or Surface RT? My quick N dirty mount. I have since changed it up and its now horizontal. Layout is a bit better spaced for my small 7" tablet. Now I want one at home! bmyoungs wrote: Source of the post Now I want one at home! You'll need to create a new account. Lame you can't have multiple layouts per account. Here is mine with cheap dock, new plug, and some hidden cables. Also confirmed I can add things to shopping list and chores via Google home. Super slick! Last picture of the day, I promise. I think I have the layout finalize. I lowered background photo brightness to about 1/3rd brightness and that seems to be the sweet spot for reading all the small text regardless of color. My unsteady hands make it blurry, not the screen. Friday is my chore day so I was using DAKboard all day to track my todo list. Later in the day the screen was black, something I haven't seen since getting it. 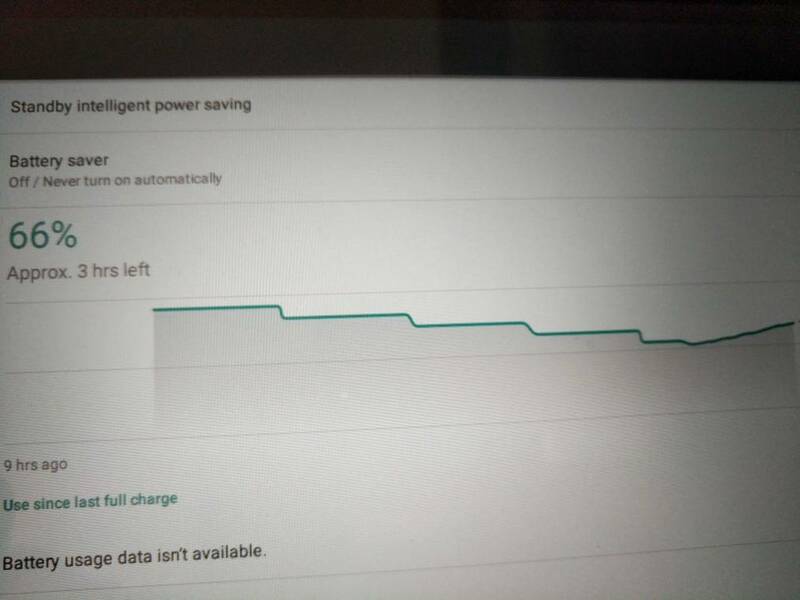 I instantly assumed I fried the tablet by having it run 24/7 plugged in for the past 10 days. I took it of the dock and couldn't get it to boot on. I plugged it into the stock charger and after a few minutes it finally showed 0 battery remaining. I got it charged back up some and it turned on just fine. Now I have questions. Why was it dead? Did it come loose from the dock? Does the dock charge too slowly and over the course of a week it finally died? Is it the plug? If the dock is the problem, it must lose about 10% of charge a day. Can I turn down the brightness and be fine? I'll be tracking the battery % over night and see what happens. 80% now. Never. I created an album just for Dak and connected to it. Maybe like 4 ever when I opened the app the background was black, but I just had to reopen it and the background was back. I've never had it work and then randomly stop on it's on. Finished. Looks a lot better than I had thought. It's running through a Chromecast connected to a spare computer I use for our events. I'm so proud of you. Now you just need to fix the background pics. Has anyone seen it other than you? What did they say? Complain about the missing bulletin board? Tyler wrote: I'm so proud of you. Now you just need to fix the background pics. I'll probably just leave the pics since the dakboard ones are much easier to read on. I was using this TV in our "lounge" area for the last few weeks so I think people will be more upset that I took it away. Dang. Dying more now. Here's my battery usage. Should charge fast enough while on the dock. Is your charger powerful enough for the tablet? Or is the tablet doing other backroung things that draw more power than the charger puts out? bmyoungs wrote: Source of the post Is your charger powerful enough for the tablet? Or is the tablet doing other backroung things that draw more power than the charger puts out? It was working fine for over a week, but now it only lasts 1-2 days. Since it is always plugged in I can't get battery usage data. I guess I could run Dak without a charger at all for a few hours and check usage.